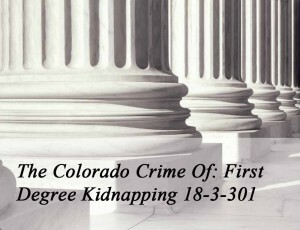 (1) Any person who does any of the following acts with the intent thereby to force the victim or any other person to make any concession or give up anything of value in order to secure a release of a person under the offender’s actual or apparent control commits first degree kidnapping. (c) Imprisons or forcibly secretes any person. conviction, the person kidnapped was liberated unharmed. 5. forcibly seized and carried any person from one place to another.